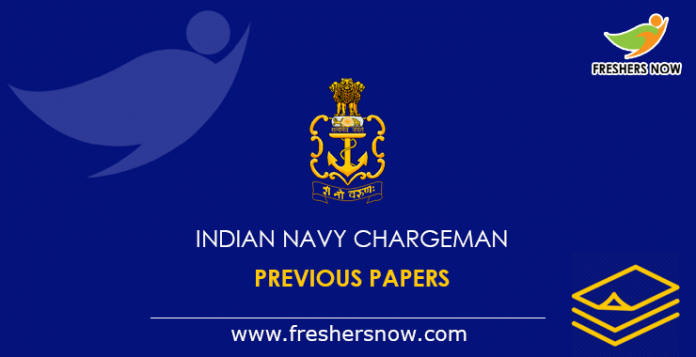 Indian Navy Chargeman Previous Papers PDF Download: Start your preparation by download the Indian Navy Group B Chargeman Question Papers available on this page. To get into the Organization of the Indian Navy, candidates should work very hard. To help the aspirants during preparation, we had given the complete information such as Indian Navy Chargeman Exam Pattern 2019 which helps to choose the subjects and topics. Also, you can improve your time management skills by having an idea on the Indian Navy Chargeman Exam. Additionally, you need to check the complete information regarding the Indian Navy Group B Exam. Hence, get the Indian Navy Chargeman Old Papers arranged subject wise at the end of the page. More information of the Indian Navy Chargeman Group B Previous Papers is given in the below sections, kindly scroll down to get them. Check out the Selection Process of the Indian Navy Chargeman (Mechanic), Chargeman (Ammunition & Explosive) from this section. Candidates should prepare well in order to get selected in the Written Test conducted by the Officers of the Indian Navy. Moreover, use the Indian Navy Group B Chargeman Question Papers in the preparation. Then, for the candidates who got selected in the written test, candidates should attend the Document Verification by carrying all the certified documents. The Officials of the Indian Navy are not allowing the Candidates without the Certificates while attending to the Document Verification round. So, make sure that you carry all the required documents. Hence, got all the information of the Indian Navy Chargeman Selection Process 2019, now from the below section, check the details of the Indian Navy Chargeman Exam Pattern 2019. Candidates can get the details of the Chargeman (Mechanic), Chargeman (Ammunition & Explosive) Test pattern. The Indian Navy Chargeman Exam Pattern 2019 will give you the structure of the Exam. That is the details of the number of subjects, the number of marks, the number of questions and the time duration of the Exam. by getting all this data, candidates will let to know the complete Pattern of the Exam and it helps in cracking the Test and gaining a good score very easily. Also, you can collect the Indian Navy Group B Chargeman Question Papers according to the subjects present in the Exam Pattern. Right after completing the application process, candidates are suggested to collect all the Indian Navy Syllabus required for the particular exam. Then, prepare a schedule and list out important topics from the syllabus. Collect several Indian Navy Chargeman Previous Papers and prepare well. Make sure that you were good in each and every topic. If not, take several mock tests. Also, should check whether you are good at time management or not. Finally, get ready to take the examination any time. Prepare a schedule using the information of the Indian Navy Chargeman Exam Pattern 2019 and hence practice well according to the schedule you had been prepared. Candidates should save the Indian Navy Chargeman Old Papers given in this section. Therefore use them whenever you want until the examination date/ day comes. We had collected more Indian Navy Chargeman Group B Previous Papers and encrypted here in this page for the sake of the aspirants who had applied for the post in the Indian Navy. We believe that provided Indian Navy Chargeman Previous Papers are very useful for all applicants. All the Best for your Exam and keep following our website Freshers Now to get more information like Results, Previous Papers and many more. Thank You!! !